I have a reader request to share with you all from Bethy. I've been looking for this tee since I first saw it and I haven't had much luck. It's a tee with these silver lips that Jeremih is wearing in his video, " Break up to Make Up." I don't to much care if it's for a male or female, I just want it.Here's a screen shot of it that I took from YouTube. No problem Bethy. You're going to be happy to see that the shirt Jeremih's wearing is pretty darn affordable, however, I'm said to inform you that it's currently sold out. So I've included it, as well as other options for you to consider. Sorry that it's sold out. It is quite striking up close. Great tee! This shirt is designed by Chris Halaska and printed on American Apparel shirts. It's very similar to the one Jeremih's wearing but it doesn't have the v-neck style and the lips are white, not silver. This tank has the design you like but it's more feminine if you prefer this over the above tee. 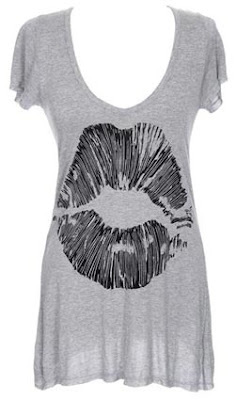 This tee has a bold, black graphic pair of lips. The Torso one actually has silver foil print, I don't think its as shiny as the original but still looks good!